In these days of high tech devices from cell phones with ear phones and microphones, i pods, lap top computers, theater sized home flat screen televisions with stereo surround sound and books on tape or CD (your choice) we have little time left to enjoy nature or take a walk. Even our kids with skate boards, chat rooms and romantic or athletic interests (or both) struggle to find a moment to take a breath and think of the outdoors or imagine a new creative thought. Time alone with our thoughts and our body's needs is what helps us regain a sense of inner personal harmony. While walking near the Point Robert's waterfront I began to feel that here in front of me was a prime example of what our society was needing to bring our world back into symmetry with the elements of loving peaceful cooperation with ourselves and others. These sailing vessels were on the dry dock and being repaired after months out to sea. Only when repairs and new equipment installations were completed would they be put back into the water. 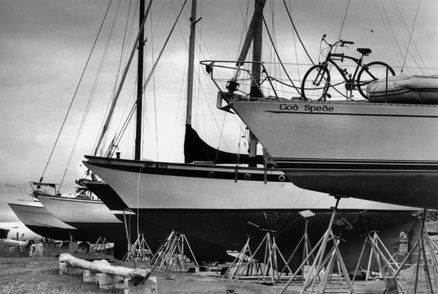 The bicycle on deck reflected one captain's desire to keep a healthy pace on land as well and his ship's name reflected this notion too.